Factory style replacement Seat Covers. Manufactured in U.S.A. to factory specifications and workmanship. Made with Original Ferrari Italian Leather, 100% fit guarantee and includes 5 year warranty. Seat Covers fit both Left hand & Right hand drive models. This set of replacement Seat Covers is hand crafted for the Ferrari 308 GTB & 308 GTS and fits the 1975, 1976, 1977, 1978 and 1979 model years. All Leather seat covers, factory style seams, piping and stitches. Fits 1975 thru 1979 308 GTB & 308 GTS models. Made with Black stripes as original. Other colors & custom covers can be made, please inquire. 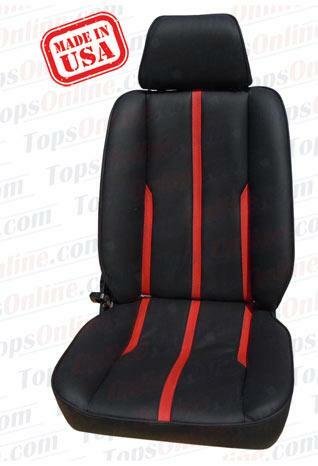 Front Seat Covers includes, 2 front Cushion covers, 2 front Backrest covers & 2 Headrest covers (6 pieces). You can re-use your existing Backrest back panels if they are in good shape or you can purchase 3 piece Backrest back panel covers separately. 3 piece back panel covers include 2 pieces Leather to recover existing boards & passenger side pocket. The stripes will be black, as original. The image below shows red stripes as they highlight the stripe placement. Though black stripes are standard, other colors can be ordered, please inquire.